This dessert pays tribute to the snow-covered mountains surrounding Salzburg. 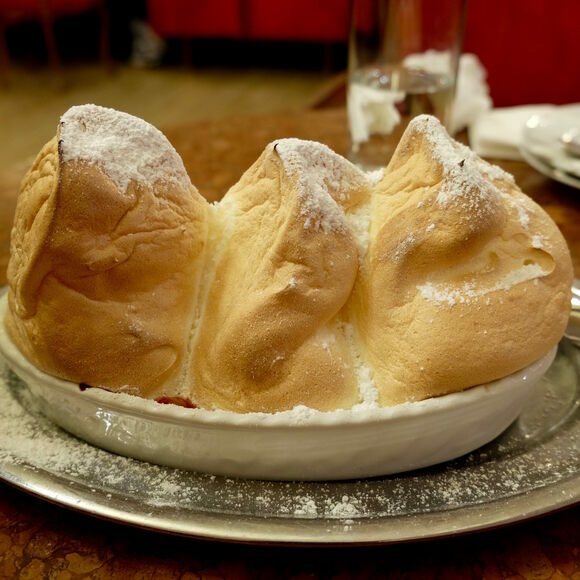 The Salzburger nockerl is a soufflé dessert that rises up from its dish like the snowy mountains surrounding its origin city of Salzburg, Austria. Made from egg, flour, and sugar, the egg whites are carefully whipped into glossy peaks before being mounded into a shallow, oval soufflé dish. The delicacy must be freshly prepared and served warm so that the whipped eggs will not lose their aeration and collapse. Once cooked, the dessert gets a dusting of powdered sugar, giving the peaks a snow-capped crown. The substantial dessert has a lightly sweet taste and a mouth-filling, fluffy texture. Occasionally chefs will dollop the egg mixture on top of fruit, adding a bed of acidity to the dish. One of Vienna's historic restaurants, once owned by Franz Sacher, the creator of the Sachertorte. Like the famed composer himself, this Mozart-homage bonbon originated in Salzburg, Austria. Pulling apart this dish creates silk-like threads of melted sugar.